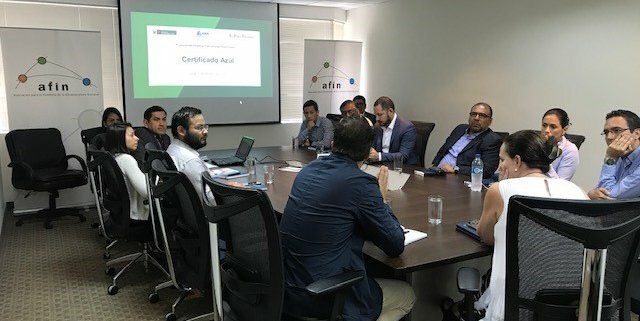 On February 1, 2019, 2030 WRG organized an event to introduce the Blue Certificate initiative to corporate members of the Asociación para el Fomento de la Infraestructura Nacional (AFIN), which is a business association that advocates for the development of public services infrastructure in Peru. 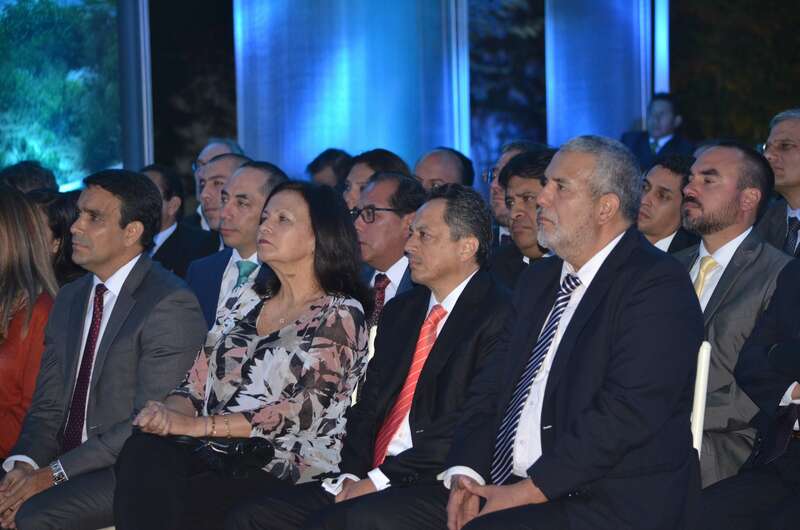 The President of AFIN, Mrs. Leonie Roca—who is also a permanent member of Peru 2030 WRG’s steering committee—presided over the event. 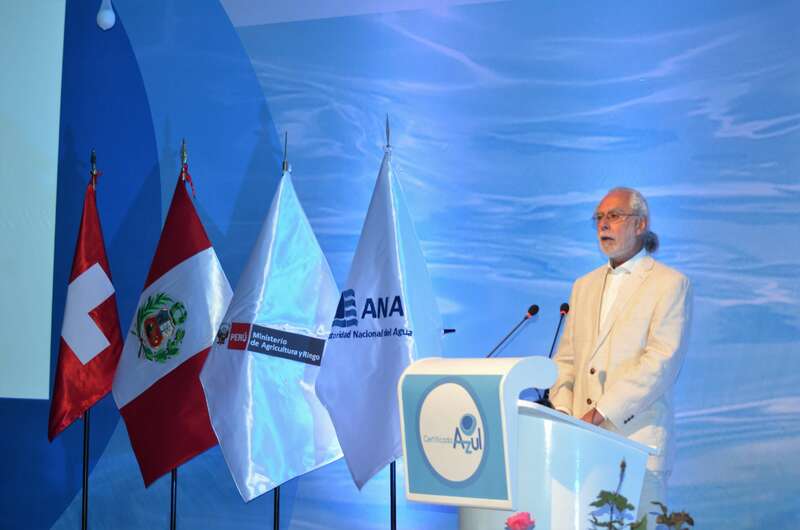 Launched in 2016, the Blue Certificate initiative is a certification process jointly developed by 2030 WRG and Peru’s National Authority of Water (ANA) to promote responsible corporate water stewardship. 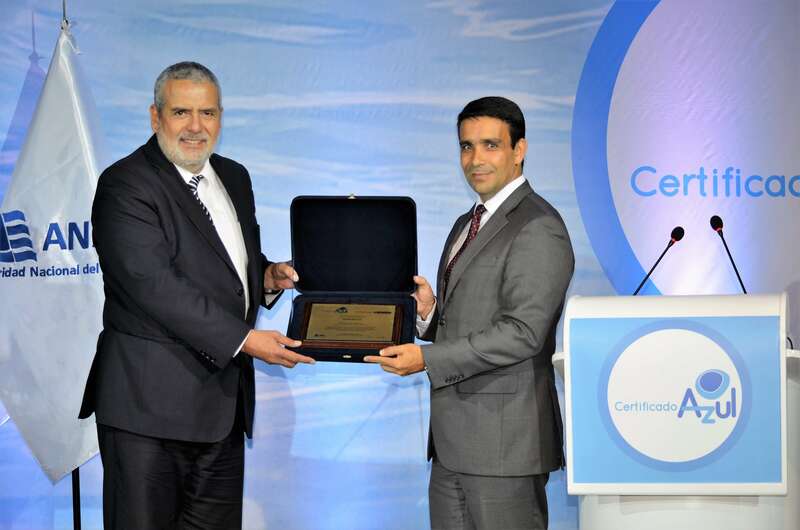 During the event, a representative of ANA gave a presentation that described the certification process and highlighted the competitive advantage companies might gain through the process. Collectively, the event’s 16 attendees represented nine private companies in a variety of industries, including energy, highway, hospitals, legal services, and transportation. All 16 attendees expressed their enthusiasm in getting certified as a water-responsible company, and bilateral meetings between 2030 WRG and several of these companies are already in underway. 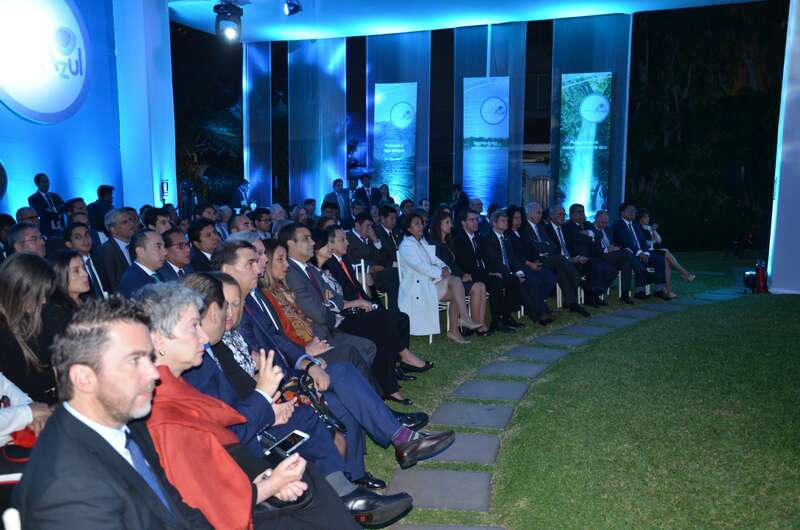 Since the time it was launched, the Blue Certificate initiative has been an indispensable tool for 2030 WRG to engage with new companies in Peru and push for a culture of responsible corporate water stewardship. 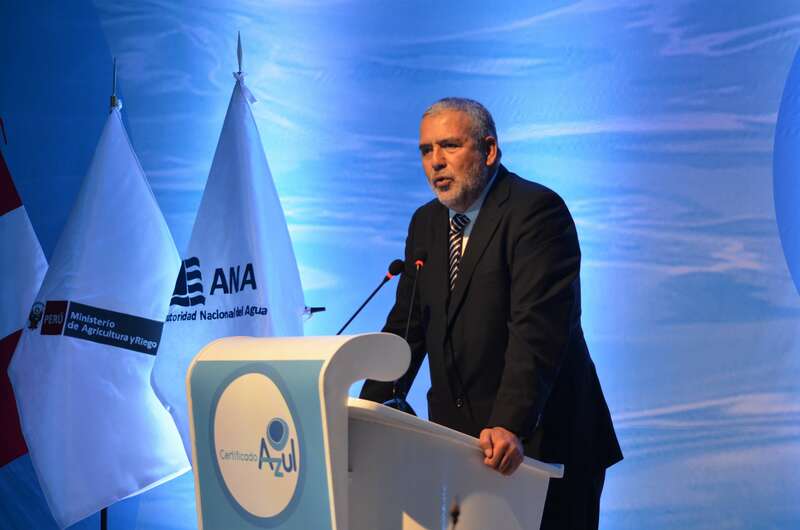 It has also provided ANA with a means to strengthen its role as a promoter of sustainable water practices in the private sector. Mongolia’s water challenge is somewhat unique. Looking only at national-level data about Mongolia’s water supply and demand, it is easy to conclude that Mongolia has enough water to support its population and industries. But such high-level data belie the concrete water challenges that are felt by its people and industries at the local level; Mongolia’s population and industries are clustered in the capital city and the Gobi mining region and both groups struggle to get the water they need. To better manage Mongolia’s precious resources, the Parliament of Mongolia passed the Water Law of 2012, which serves as an umbrella law for integrated water resources. Together with other complementing laws, such as the Law on Water Pollution Fees (2012) and the Law on Use of Water Supply and Sewage System in Urban and Settlement Areas (2011), the Water Law provides the legal basis for charging consumers for the use of water, discharge of wastewater and collecting penalties for exploitation and violation of rules. While the economic instruments, such as water service charges, water usage fees and wastewater charges, were introduced with the Water Law (2012), the existing design does not provide any incentives for either the sustainable use of water resources by industries or investing in new technologies to increase treat industrial wastewater. When the Government of Mongolia approached 2030 WRG for its support, 2030 WRG took a different approach. Instead of addressing each problem separately, 2030 WRG adopted a macro perspective, and brought people who are being impacted by issues with those who can help bring change to sit at the same table. 2030 WRG’s Mongolia team designed an inclusive stakeholder process to develop a new water pollution tariff model that incorporates Polluter Pays principles to support fee collection that is linked to volume and load of wastewater discharge and is easy to implement. In addition, it is currently supporting a new urban water tariff structure to drive greater water use efficiency and wastewater treatment and reuse. Mongolia 2030 WRG went beyond a narrow focus on existing bottlenecks in policy implementation and enforcement and looked for opportunities to crowd in the private sector at a large scale. In partnership with IFC, it brought Mongolia’s mining companies into the dialogue, as their operations represent a huge part of the country’s export revenues, and the mining industry has traditionally suffered tensions with communities around the sustainable use of water resources. 2030 WRG also supported reform in water governance by bringing all relevant actors at the river basin level to collectively discuss and decide water resources planning and implementation, thereby promoting transparency and dialogue to resolve contentious water issues. Such a holistic and inclusive approach to water resources management has never been tried in Mongolia. 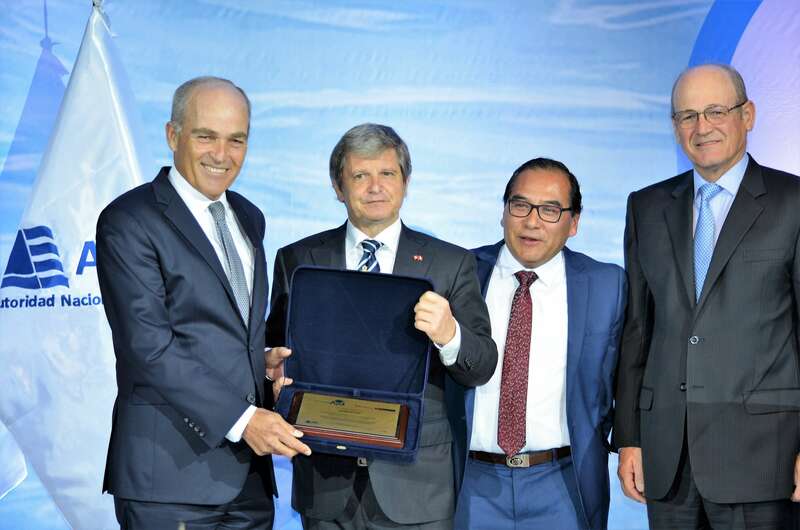 To recognize 2030 WRG’s valuable contribution, the Mongolian government granted a high-level ministerial award to 2030 WRG on December 26, 2018. In metropolitan areas of Brazil, inadequate coverage of sewage collection and treatment infrastructures is the biggest cause for the widespread pollution of urban rivers, streams, and lakes. Many of the watercourses that cut through urban areas eventually turn into sewage channels that run on the surface or under the ground. Besides that, due to inadequate public services and a general lack of awareness among the population about proper waste disposal, river channels and rainwater pipes have also become receptacles for all kinds of solid waste. Polluted and smelly, urban watercourses and riverbanks have become abandoned spaces that are closed off to the public. When it comes to urban water drainage, policies in Brazil have historically been focused on the channeling of rivers and streams to combat floods or reclaim land for urban expansion. Urban watercourses have been seen as elements that must either be tamed or exploited for urban development. But it is possible to adopt an alternative perspective—urban rivers as elements that could be used to enhance environmental quality, urban landscape, and quality of life. 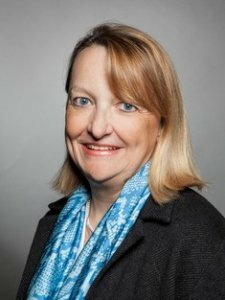 Although such a perspective is slowing gaining recognition, public institutions responsible for managing cities are still deeply entrenched in a culture that is characterized by sector-segmented visions, objectives, and funds that favor existing engineering solutions and immediate pragmatism. Urban design and environmental sanitation are but afterthoughts. If public institutions were to rethink their priorities and funding for urban water drainage and redesign institutional responsibilities, urban rivers and streams that are currently degraded could actually become healthy and attractive public open spaces. Working off this idea, Brazil 2030 WRG began to champion the revitalization of the Anhanguera stream, which runs through underground drainage pipes in downtown São Paulo, which receive domestic sewage from surrounding households. These drainage pipes are also old and damaged and are no longer able to support increased storm waterflows, leading to frequent flooding in the area. To revitalize the stream and its surrounding area, Brazil 2030 WRG’s proposal calls for the cleanup of a portion of the stream’s water so that it could flow above ground and become part of the urban landscape. Accordingly, Brazil 2030 WRG set up a working group to discuss the project and mobilize the first set of stakeholders, including: (i) Companhia de Saneamento Básico do Estado de São Paulo (SABESP), which is the state sanitation company that is responsible for sewage collection and treatment in the city of São Paulo; (ii) the City Government, which is responsible for urban planning and the management of drainage systems and solid waste collection and disposal; and (iii) representatives of the surrounding communities, including residents, architects that work on the neighborhood, and users of a public square and a public library. Further down the line, the working group plans to engage with surrounding commercial establishments and encourage them to handle their solid waste in a more responsible manner. Because there are many homeless people in the proposed urban intervention area, the working group also plans to discuss ways to meet their basic sanitation needs. The working group is currently discussing the fundamental topics for the revitalization project, including the integration of drainage, sewage collection and solid waste management; the use of water above ground as an urban asset; and the early participation of the community. If successful, this initiative could help change prevailing views of urban watercourses in São Paulo and serve as an example for other Brazilian cities. On December 6, 2018, Peru 2030 WRG’s 25 steering committee members gathered for the last meeting of 2018. Mrs. Mercedes Castro, Executive Director of Agualimpia—an NGO dedicated to expanding access to clean water and sanitation in Peru—and Chairman of Peru 2030 WRG Steering addressed her welcoming remarks to her fellow committee members, all of whom are all high-level representatives from academia, civil society organizations, international organizations, the public sector, and the private sector. Mr. Alberto Rodriguez, World Bank Country Director for Peru, spoke about the water challenges in Peru and detailed the World Bank’s agenda for addressing such challenges. He reflected on 2030 WRG’s work in 2018 and restated the importance of 2030 WRG’s collaboration with the World Bank. 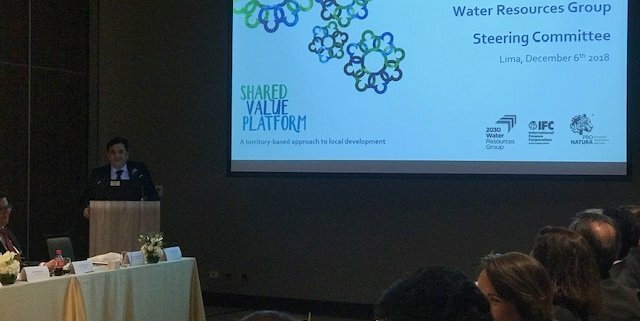 In the spirit of reflection, Héctor Gómez, IFC Country Manager for Brazil, and Marcelo de Andrade, President of Fundación ProNatura, jointly presented the Share Value Platform, for which Mr. Gómez is the project lead. Spearheaded by 2030 WRG, this platform, which was initially implemented in Brazil, is a territory-based initiative that aims to bring sustainable and inclusive development to mining areas in vulnerable regions using a value chain development approach. 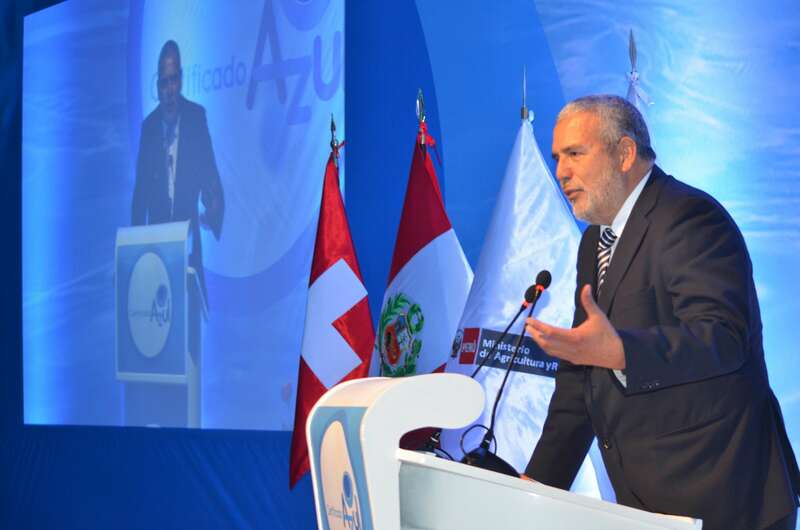 This presentation was especially well received because the mining sector is such an important part of Peru’s economy. Just as the end of a year is a time for reflection, it is also a time for aspiration. 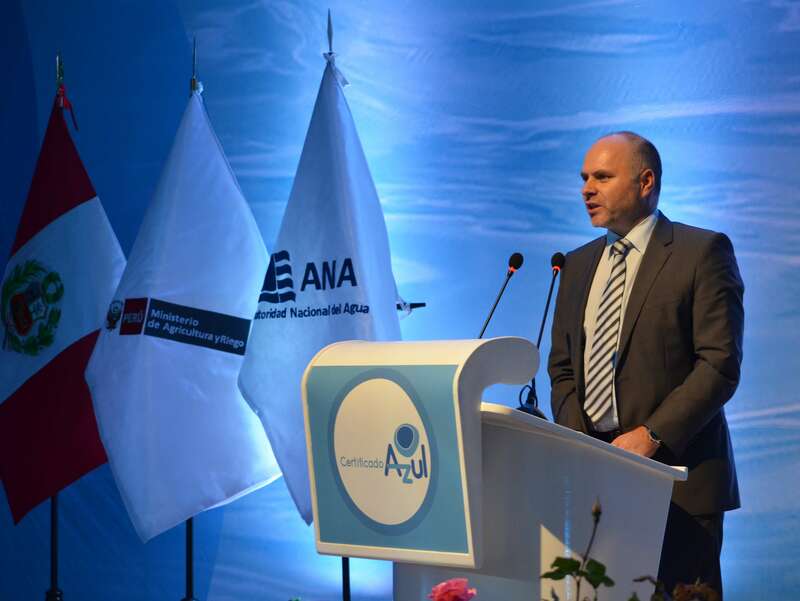 Dominic Waughray, Managing Director and Head of the Centre for Global Public Goods and Co-chair of 2030 WRG presented his thoughts about how the public and private sectors could collaborate to promote transformational change in Peru’s water sector. Because change is the only constant in today’s world, he urged international organizations—which are well place to create positive impact due to their global footprint—to maintain their relevance by embracing adaptation and innovation. 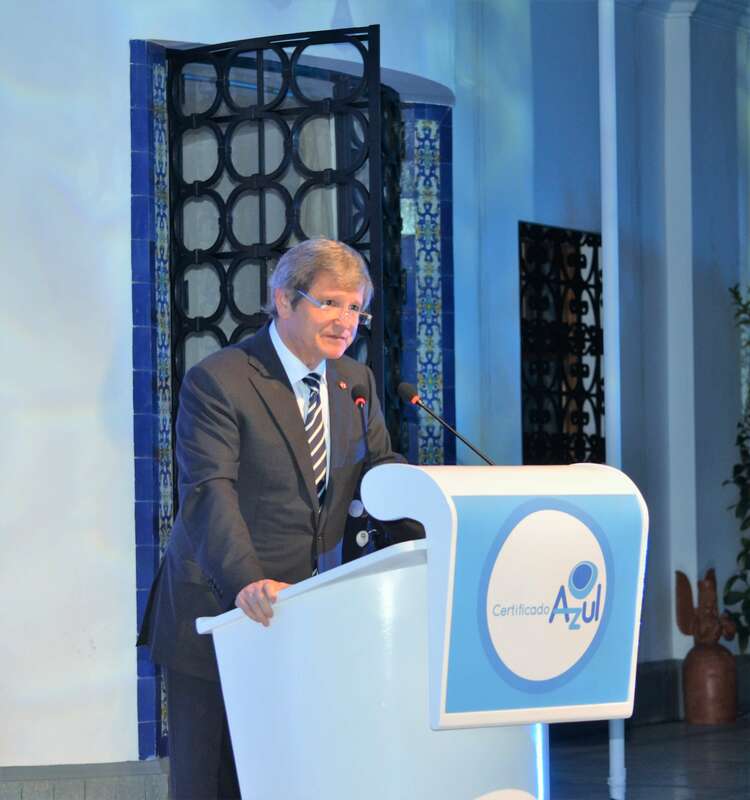 In line with Mr. Waughray’s call for adaptation and innovation, Gonzalo Delacamara, Senior Advisor to OECD, spoke about the untapped potential of using a circular economy approach, which is a concept that is gaining favor in both the public and private sectors, to implement sustainable water resources management solutions. The lively conversations that emerged from the meeting are evidence for the value of inclusive multi-stakeholder engagement. 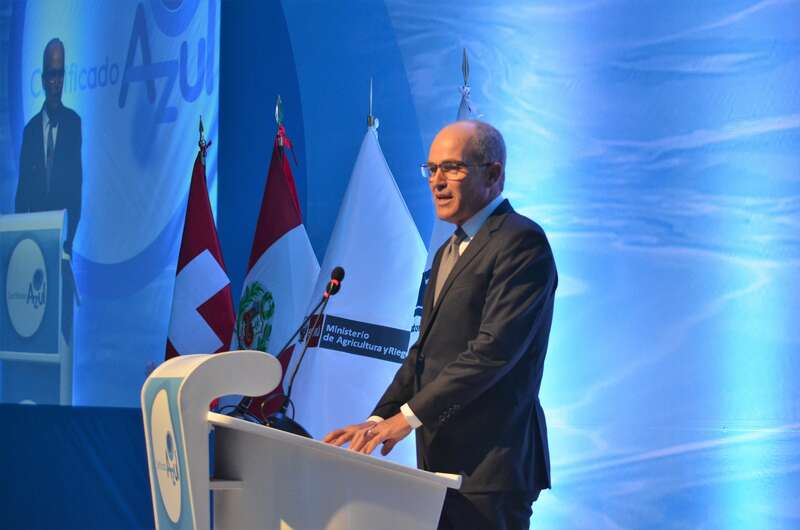 The principle of inclusive dialogue will continue to guide Peru 2030 WRG’s work in the coming new year. Red Lands Roses is a medium-sized flower farm producing roses exclusively for export. The company has invested in water-efficient technologies and operational approaches to reduce the volume of new water abstracted each day by recycling nearly all the water that is not either consumed or evaporated. Likewise, the minimal waste water produced is bio-organically treated before being released back into the environment. The Kenya 2030 Water Resources Group Governing Board unanimously endorsed two project proposals within the industrial and urban water management workstreams aimed at improving reliable data collection of industrial water-use and addressing the challenge of non-revenue water (NRW), respectively. Following several months of bilateral engagements with stakeholders, the proposals outline fresh approaches to two intractable water management challenges: how to incentivize industries to invest in water conservation and efficiency technologies, and how to reduce national non-revenue water rates of up to 45%. The economic growth targets laid out in Kenya’s Vision 2030 and President Kenyatta’s “The Big Four” agenda take for granted the long-term dependable availability of adequate and sufficient water resources – but this isn’t a given. Industry’s water demand is estimated to increase by 140% by 2030 amid a growing supply and demand gap that is projected to reach 63% in Nairobi by 2035. Despite the sobering projections, making the business case for industries to invest in water conservation is a challenge for policymakers. Water is often perceived as cheap and its scarcity risks are not well understood. The challenge is complicated further by the lack of reliable data on industrial water-use. The little data that does exist is scattered among various institutions and not accessible at an aggregated level for decision making. To overcome this, KIWA, in partnership with the Kenya Association of Manufacturers (KAM), the Water Resource Authority, and the Ministry of Industrialization, proposes to develop a browser-based platform to improve reporting, data collection, and benchmarking of industrial water use. By aggregating water utilization across industrial processes leading up to the discharge, the project aims to create more awareness about companies’ own performance with regards to local and international water-use benchmarks and hence be a driver for efficiency; provide a valuable source of information for planning and regulation authorities and water allocation plans; and deliver a sound foundation for evidence-based decision making and policy formulation. Despite significant efforts, national NRW levels have stagnated between 42-45% throughout the last 10 years. The high level of physical and commercial water losses costs the country about KES 8 billion annually. Building on the experiences from blended financing and the on-going National Performance-Based Financing (N-PBF) initiative, the urban water management workstream project aims to support utilities in adoption of Performance Based Contracts (PBC) as a new approach to reduce NRW in partnership with private sector. In a PBC approach, a private company is contracted to carry out a comprehensive program to cut water losses and is paid based on the performance achieved, while the ownership of the system remains in public hands. PBCs have proven to be 68% more effective than in-house NRW reduction programs, and proof-of-concept projects abound in locations ranging from the Bahamas, to Vietnam, to Bangkok, to Brazil. While PPPs can be applied through the entire water supply value chain ranging from abstraction, treatment and distribution, the PBC approach is being proposed to address NRW for urban water service providers (WSP) in Kenya because of three key reasons: first, reducing NRW offers a “cheaper” way of getting new water supply. Reducing both physical and commercial losses of water already in the distribution network delays the need for developing additional sources by optimizing what’s already treated and made available to consumers in the distribution network. Second, reducing NRW will contribute to the utility’s financial viability by maximizing revenues which support struggling WSPs to eventually climb up the creditworthiness ladder. And third, reducing NRW improves 24/7 reliability in water supply to consumers. Moreover, PBCs-for-NRW reduction are an effective means of maximizing finance for development by structuring the joint ventures in such a way that the private party finances the NRW reduction investments up-front through own equity or a commercial loan or debt arrangements with local banks. The concept note proposes to identify and support preparation of 3-5 demonstration PBCs for PBC- NRW project design. The proposals were put before the board during its second bi-annual meeting of 2018, chaired by the Hon. Simon Chelugui and Mr. Richard Fox, Chairman of the Kenya Flower Council and Director Sustainability with Flamingo Horticulture, standing-in for Mr. Vimal Shah. The board approved the projects to proceed according to the plans detailed in the concept notes, and has committed to support the initiatives in mobilizing political champions at national government and county governments levels. In 2016, the 2030 Water Resources Group (2030 WRG) and its partners created the Blue Certificate, an initiative that is one of the workstreams of Peru 2030 WRG’s multi-stakeholder platform (MSP). 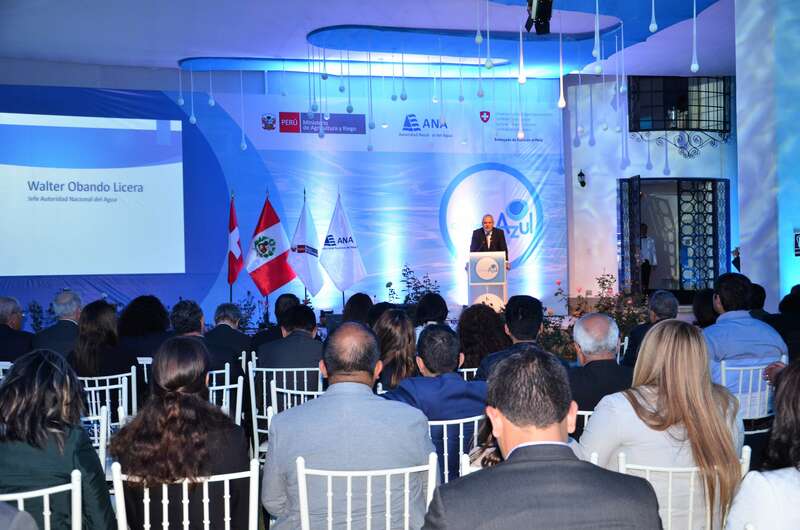 Led by Peru’s National Water Authority (ANA), the program encourages companies in the private sector to assess the water footprint of their processes and become water-responsible companies. Peru is a beautiful and amazing country with lush mountains and forests. But you do not have to go far out of Lima to see that it is water stressed. In fact, Peru ranks among the top 30 countries that suffer from chronic water stress. 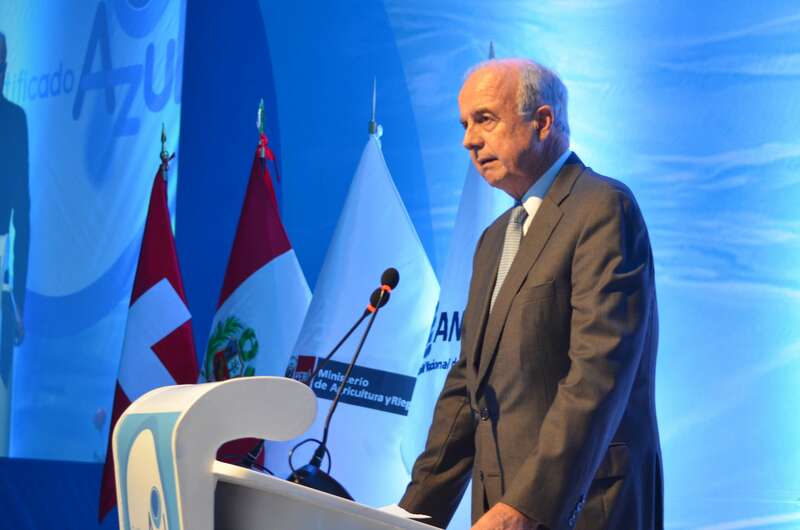 Approximately USD45.7 billion in investments are required by 2035 to meet Peru’s water needs. As is the case everywhere in the world, public finances can only do so much, and the private sector can play a transformational role in closing this infrastructure financing gap. It is therefore unsurprising that many governments stood up in 2015—when the SDGs were being adopted in New York City—and said that companies in the private sector are needed if we were to meet the SDGs by 2030. 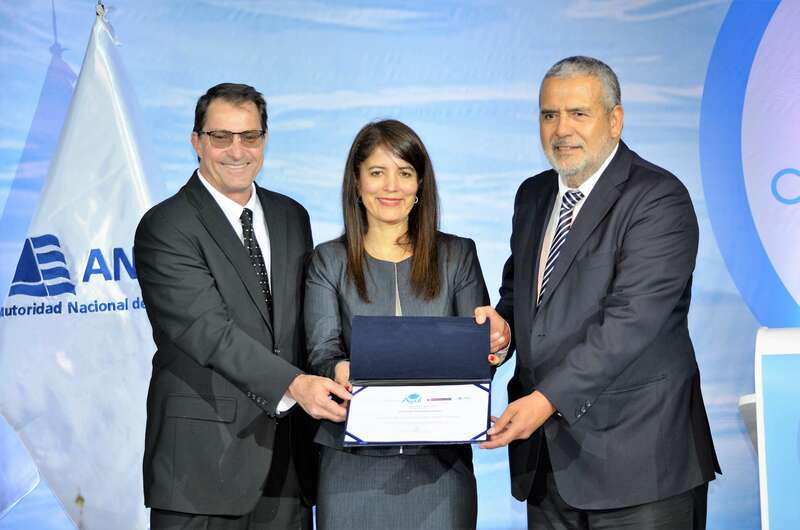 It makes me so proud that in 2016 the Peruvian government and 2030 WRG co-developed the Blue Certificate program, whereby companies are awarded the Blue Certificate if they fulfill three criteria: (1) develop a Water Footprint Assessment following ISO 14046; (2) commit and accomplish water footprint reductions; and (3) set out and implement a program of shared value with the communities in the watersheds they work in. 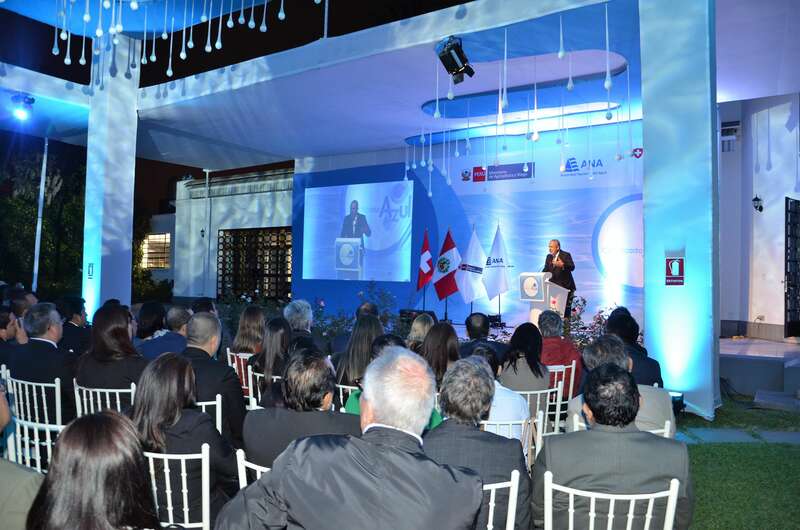 I had the honor of joining the recent Award Ceremony in Lima, Peru, on 7th November when Compañía Eléctrica El Platanal S.A., Compañía Minera Coimolache S.A. (Buenaventura Group), Nestlé Perú, and Mexichem Perú were awarded the Blue Certificate. Four additional companies also received recognition for applying for the certification process. 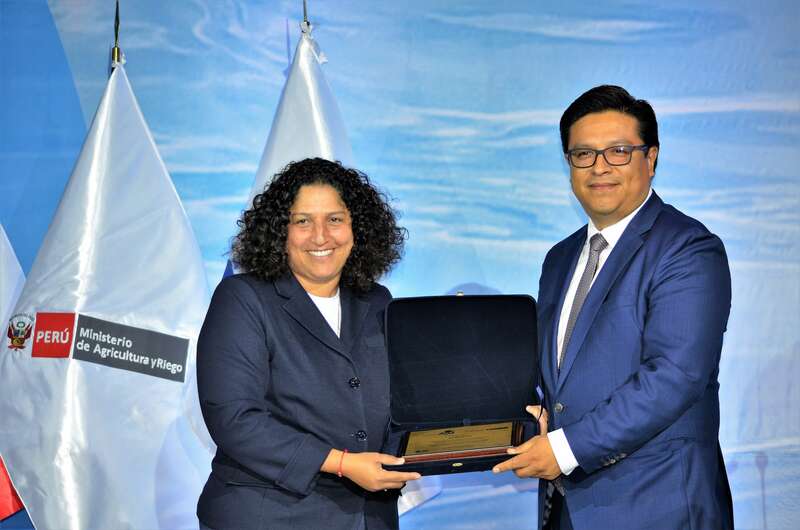 Fabiola Munoz Dodero, Peru’s Minister of Environment, spoke at the event, and highlighted the role the program plays in driving action for healthier watersheds in Peru. 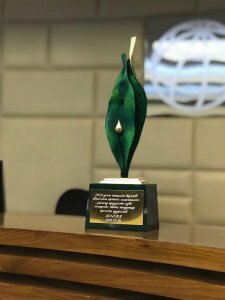 It is this kind of recognition by governments of the private sector’s role in improving water resources that gives me hope that we can make progress toward the SDGs. But recognition must fundamentally be about results if we want to ensure that our water resources will, in fact, be better in 2030 in comparison with our current situation. 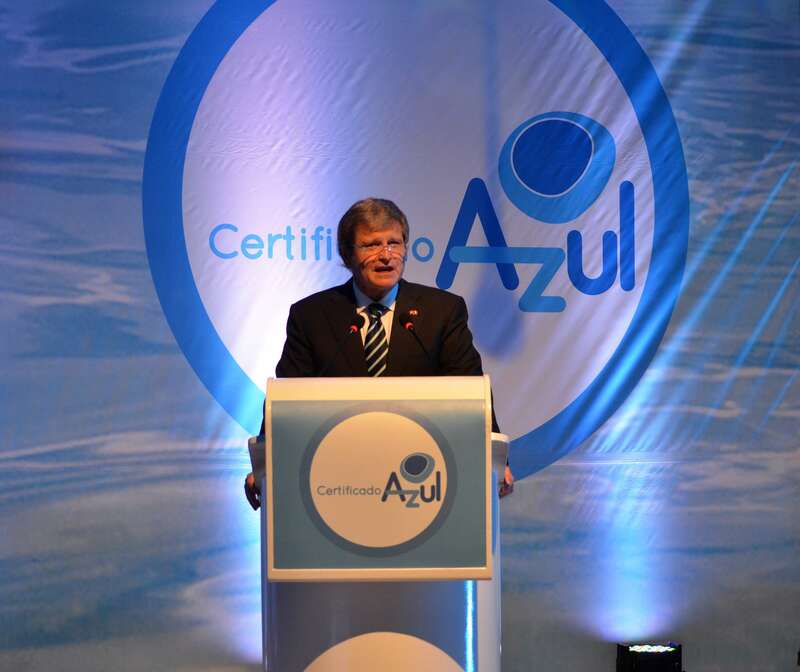 To date, the Blue Certificate has resulted in a reduction of approximately 79 million liters of freshwater use per year and a reduction of approximately 137 million liters of non-treated wastewater discharge. 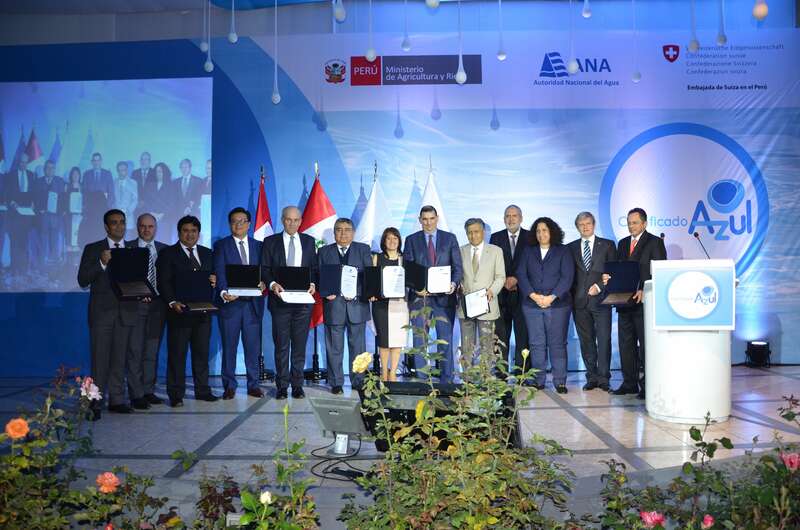 Thirteen companies have already presented their Shared-Value Projects in: (i) efficient domestic water use; (ii) rural irrigation improvement; (iii) wastewater reuse in public spaces; (iv) and promoting a water conservation culture. The projects are expected to reach approximately 9,000 direct beneficiaries and 20,000 indirect beneficiaries. In addition to a focus on results, there needs to be a way for companies to keep active and motivate others. 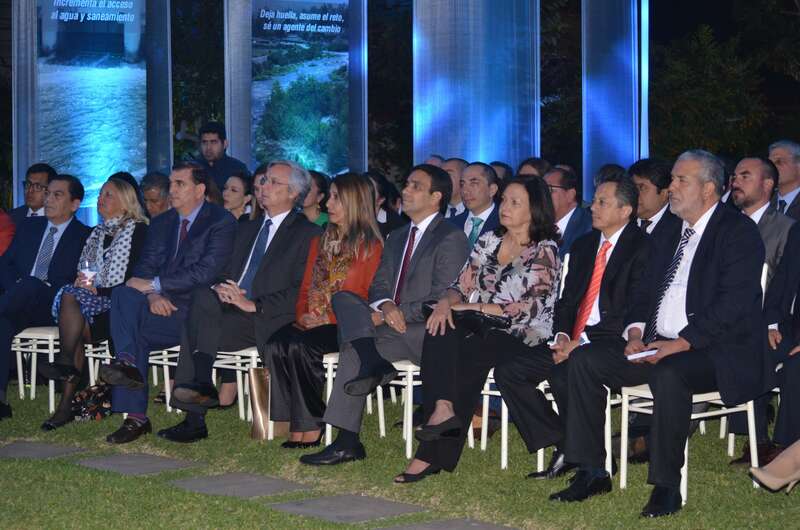 At the 7th November Awards Ceremony, Mexichem—the first company to be awarded the Certificate—renewed their commitment. Through this renewal process, I hope other companies will see that they too can make a difference in making their country more water secure and thereby their own operations more sustainable. 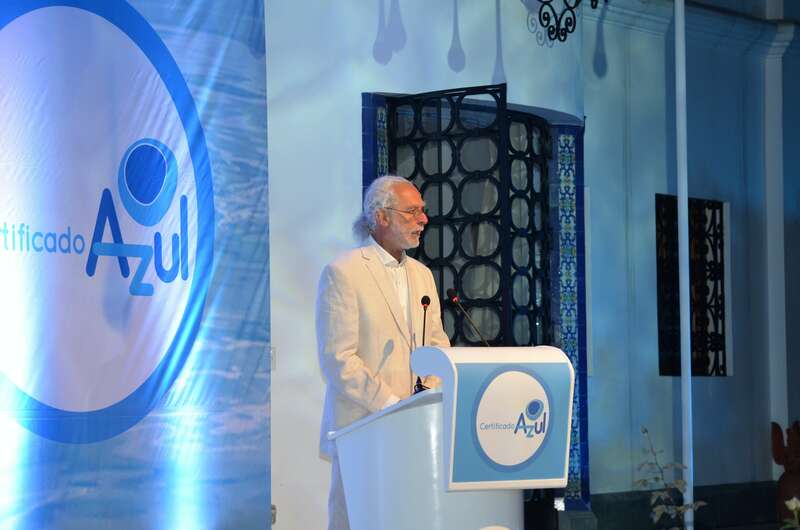 In the past, I have heard people say that there are too many competing initiatives in water. My first thought is often “really?” For a challenge as big and complex as water resources management, it makes sense to welcome the participation of every company—and other stakeholders—that wish to become better stewards of our shared water resources. There is no silver bullet to solve our water problems. But if we can find a way to harness the passion and energy of everyone and bring together our efforts in true collaboration, we can create meaningful change. In closing, I would like to invite every company that wants to become more water responsible to learn more about what 2030 WRG can do to help them achieve that goal.